While sitting quietly inside the night after her son’s death, Deanna breaks the silence with a mix CD. Listening to the music proves to be too much for Reg, as he asks Deanna to turn it off. Carol is off in her own home preparing some pasta, while Sasha sits in the watchtower on guard. A knock at Deanna’s door reveals the casserole Carol made with a consolation card. Taking only the card, Deanna immediately sets it on fire and watches it burn. Outside of the walls, Aaron and Daryl notice that there are more walkers than there used to be. 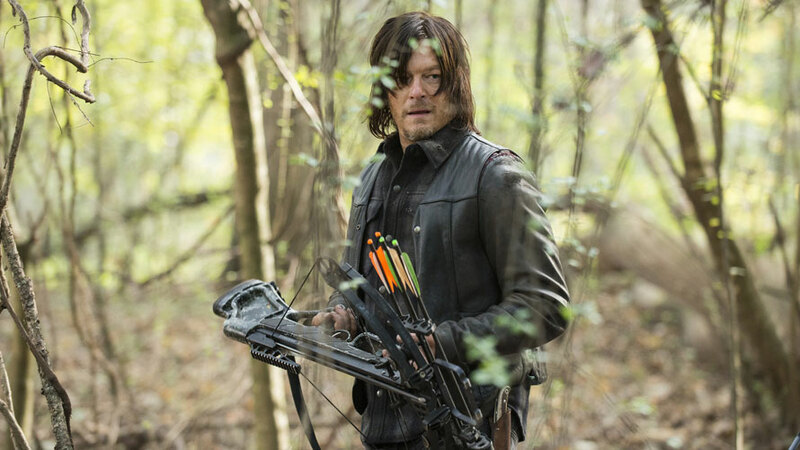 In the distance, Daryl spots the faint glow of light and points Aaron toward potential survivors. Nicholas and Glenn provide very different accounts over the events at the warehouse. Nicholas gets himself filmed by Deanna’s crew, while Glenn gives his story to Rick. Nicholas focuses on placing the blame on Glenn as much as possible, trying to convince her about needing to ban Rick’s group. Glenn and Rick struggle with how to reconcile these events with trying to make it work with these new people. Rick heads over to speak with Carol, who steers the conversation over toward her concern for Pete and about the special lock on Sam’s closet door. Rick struggles with Carol’s focus on Jessie’s safety. Rick steps out into the yard and draws his gun out of the holster. Pete walks up to say hello to Rick, who is seemingly stricken with anger. Rick asks Pete to just walk away, while still holding the gun to his side. The next morning, Michonne peacefully wakes up to find a basket of laundry and a personal conflict. Seeing the officer clothing, she appears challenged by putting them on. Rosita shows up and lets her known that Sasha spent the entire night in the tower. They go outside the wall to search for her. Rosita challenges Michonne for appearing screwed up after finding civilization, particularly the lack of carrying her trademark sword. They find a few walkers with wounds in the back of their heads, realizing that Sasha must be hunting walkers. At the grave site, Rick finds Deanna standing alone. While checking on her, he brings up the concern with Pete. She admits that she knew about the domestic violence but lets it slide because of his medical skills. Rick offers an option to physically separate the two. She refuses and challenges his idea that Pete may need to be killed. At most, she agrees that they may exile people who don’t fit in. Out in the woods, Carl is discovered by Enid, who knew that he was following her. He tries to convince her to return to the community, but she refuses to go. She runs off and he chases after. They stop when she notices a walker. Winding up a timer, she chucks it like a grenade, attracting the walker to the noise. They run off in another direction once it is distraction. After getting away, Enid admits that she likes it outside of the walls. They bond over their mutual love of the outside. Carl tries to understand her better, but they get interrupted by multiple walkers. Finding a nearby tree to hide in, they listen and watch as the herd passes by. One of the walkers has a “w” scratched into its head. Glenn goes to confront Nicholas, highlighting his failures during the recent and previous trips outside of the walls. Nicholas pushes back, but Glenn stands his ground, stating, “I’m saving you.” Later on, Nicholas goes to recover his handgun buried next to a tree. Sasha emerges in the woods, taking out walkers with her sniper rifle. Michonne and Rosita appear and ask her what she is doing. Sasha, choosing to be headstrong, refuses to leave and tries to take out all of the walkers herself. Michonne takes a moment to gather herself and then joins the fight with Rosita following immediately behind her. After taking out nearly all of them, Sasha is surprised and tackled by one, causing Michonne to step in and save her. Sasha blows up at them, believing that she is inconsolable and feeling responsible for Noah’s death. After taking a moment, she walks off, leaving Michonne and Rosita to choose to follow her again. While on their search for more survivors, Daryl and Aaron come across more random body parts without torsos. The scene looks fresh, so they continue to search with their guards up. They find a body tied to a tree with its guts ripped out. Lifting the girl’s head, Daryl notices the “w” carved on the forehead. Rick shows up at Jessie’s place and confronts her about the domestic violence. She tries to promise that it will stop and that he can get help. Rick is unyielding in his support for her, so she challenges his obsession with helping. Assuming that he has other intentions, she denies his help and walks away. Rick struggles with her refusal and starts to lose himself while standing out in the street. He rushes back over to Jessie’s house and tells her about Sam’s desire for a gun and tries to explain his reason for caring. He tries again to convince her that he can keep her and the boys safe. She challenges whether he would do this for others, to which he admits that he wouldn’t. She accepts his help just as Pete shows up and questions his presence. Jessie decides to stand firm and ask Pete to leave, causing him to start a fight with Rick. Rick sends Pete through the front window and is nearly choked out before Jessie intervenes. Carl tries to pull Rick off as well, but he maintains his grip until Deanna shows up. She tries to stop it, but he gets up and starts to challenge Deanna’s leadership. As Rick attempts to make a big speech, Michonne blindsides him with a blow to the back of the head. Review: Another season is coming to a close and the tension could never be higher. 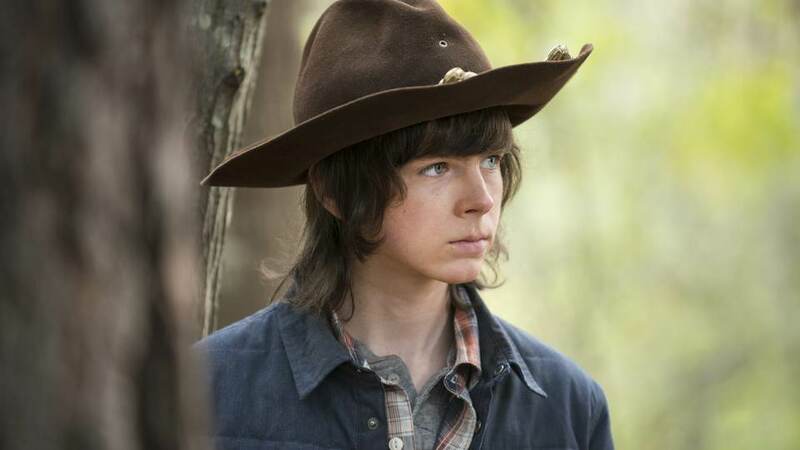 While things seem to be relatively safe for the group, Rick’s group is cracking and the people of Alexandria has no idea what is coming in their future. Sasha is cracking under the pressure of having time to let the events of Georgia and the road finally sink in. She lost Bob, Tyreese, and now Noah. She trained to become the great sniper of the group and Alexandria does not seem to have an effective use of her skills. She showed a bit of this uneasiness as soon as she got to Alexandria. Now she is in a constant state of craziness and aggression. Her tense behavior could either prove to be vital in a dangerous situation, or, more likely, will get her killed sometime soon. Glenn’s confrontation with Nicholas and Deanna’s concerns with Rick help to show that there will be a mini war between the two factions. It may not result in actual violence, but the build up could put the entire community on edge, if they aren’t already by Rick’s and Pete’s fist fight in the street. The lying by Nicholas aside, their reaction to the situation is an example of fantasy versus reality. Glenn, Rick, and their family has experienced life outside of the wall, and it was brutal. They lost people, even when they were focused survival. Deanna’s community has lost people, but they are also fearful of the real threat outside of the walls. Then there is the fight…Rick went psycho…but so did Pete. This was ready to boil over, but Jessie somewhat agreed to how it happened. Pete’s behavior was so volatile that he was going to truly harm Jessie if Rick did not eventually step in. More important than the fight itself was the realization that Deanna knew about the domestic violence and would only exile someone instead of killing them. This policy suggests that Alexandria is too sheltered for its own good. Rick might be using too heavy of a hand with his way of dealing with trouble inside the walls, but he still appears closer to a true steward of safety than the people of Alexandria (even in the crazed state). Rick will likely spend a portion of the next episode in timeout because of his actions, but Deanna will likely also want to exile him. The only thing that might be more important for the season finale is the rise of walkers around the wall. Similar to the challenges of the prison, the walker buildup outside of Alexandria could threaten the integrity of the walls. There was a moment when Rick’s group first got there that they kind of challenged Reg on the development of their protective barrier. It would be interesting to see what happens when a mega-herd shows up and knocks on the side door to the community. The cast is feeling a little big at the moment, with Noah being the most notable death in the past several episodes. Sasha has put herself in danger and there are a few characters that have been in the background enough to bring their storylines in jeopardy. An attack on Alexandria would probably result in deaths to both groups, but who knows until they actually premiere the episode? And where is Morgan? ?